"Moist, eggy, chunky, and...no pickles!" Place potatoes into a large pot and cover with salted water; bring to a boil. Reduce heat to medium-low and simmer until tender, about 20 minutes. Drain and cool potatoes, then peel and dice. Cover and refrigerate overnight. Place eggs in a saucepan and cover with water. Bring to a boil, remove from heat, and let eggs stand in hot water for 15 minutes. Remove eggs from hot water, cool under cold running water. Peel and chop eggs. Cover and refrigerate overnight. Combine potatoes, eggs, and green onions in a large bowl or roasting pan. Stir mayonnaise, mustard, salt, and black pepper in a bowl; pour mixture over potatoes and gently toss to combine. Refrigerate until ready to serve. So thankful for this recipe! it has all the same ingredients I use for a potato salad, but I have to make enough for a small wedding and was so unsure how to do that! Great recipe! 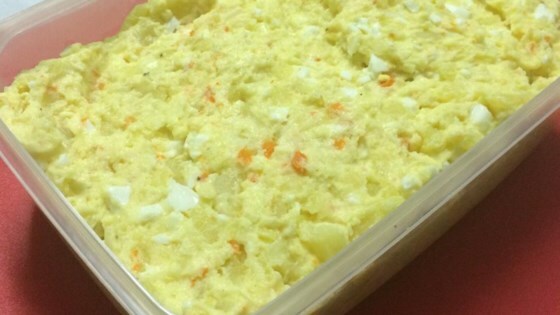 So nice to have a decent and tasty potato salad without those offensive and improper pickles added. This was great! Made one batch and put it in two bowls added 1 cup of celery to one and some celery salt instead of regular salt. Ran out of both both so good. Delicious, perfect for our family reunion! Only change, I added some dill pickle juice to the dressing. Yum !